It all boils down to one question: are you in a home, or somewhere else? Tall building, dish on the roof. Whether you’re serving one room or many, a long run from the roof to the equipment closet deserves an amplifier. The amp should be placed as close to the roof as possible and should be designed for “trunk” use like the one above. Satellite amplifiers need to be a good bit more complex than regular ones. If you’re feeding a lot of receivers, you’re probably going to have equipment closets in several locations. 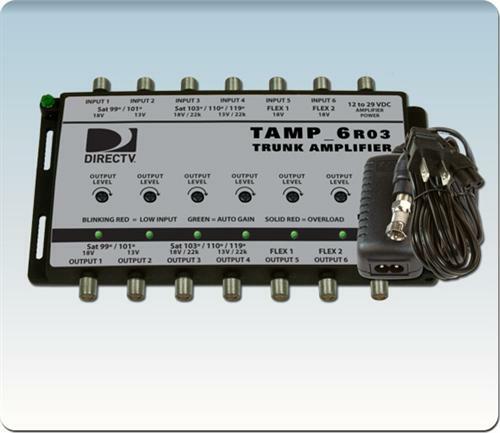 Amplifiers can help you compensate for the loss due to adding splitters and taps. If you’re using a modulator or headend system. If you’re operating a headend system, the output from that system can be amplified so it can reach a lot of different locations. These systems are common in bars, hotels, and some apartment complexes. Residential users should almost never use amplfiers for satellite. A DIRECTV or DISH satellite antenna should be good for 150 feet between the dish and the multiswitch or first receiver, and so there should be very little need for an amp. DIRECTV’s SWM distribution and DISH’s MoCA implementation for its Hopper DVRs do not allow amplification at all. Once you get to the point where you lose signal, which is usually about 150-200 feet, there is nothing more you can do other than run RG11 cable or reduce the number of splitters you’re using. Why can’t you have two DIRECTV Genies on your account?